ZenUnwired: Bandwidth Hogs - How much data do our mobile devices consume? Bandwidth Hogs - How much data do our mobile devices consume? Have you ever wondered how much data our beloved mobile devices consume? 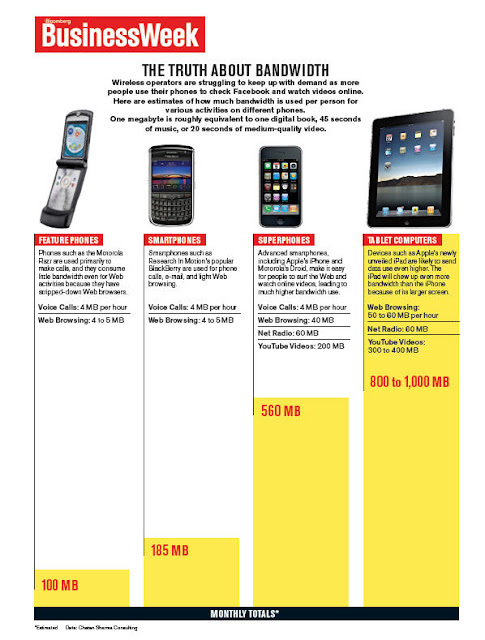 Here's a handy chart from BusinessWeek/Chetan Sharma Consulting, that might help you understand why mobile networks in the US are stretched thin. As these devices proliferate, unless wireless carriers upgrade their networks, expect your service to get spottier. Indian wireless carriers, watch and learn!